Intel may be struggling on the PC side of its business, but the chip giant is making aggressive moves in the data center and enterprise computing sector. 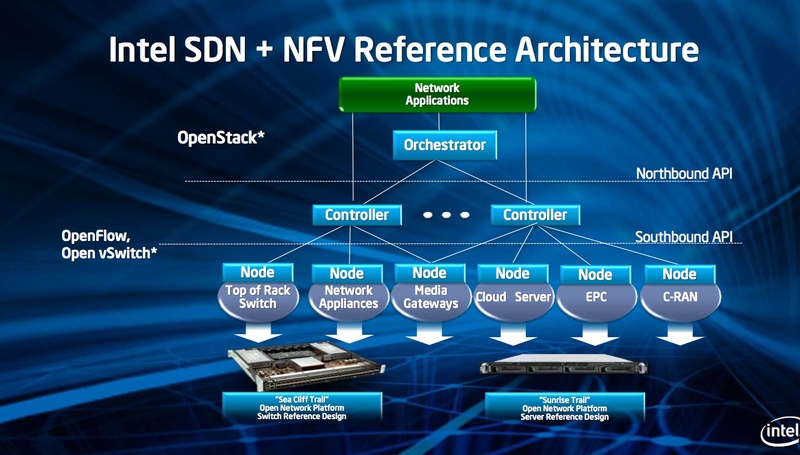 After buying networking silicon vendor Fulcrum in 2011, Intel introduced a few products and hinted at its plans, but on Wednesday at the Open Networking Summit it revealed its SDN strategy and took the gloves off. Intel is showcasing its networking silicon, but it’s also offering two reference designs — one for new switches and one for new servers that would use Intel’s new chips. It’s also showing of a software layer called the Intel Data Plane Development Kit for OpenVSwitch that will accelerate packet processing on Intel’s CPUs instead of on dedicated network processors. One of the reference designs is aimed at the data center and the top of rack switches made by Cisco, Juniper, Arista and Force10 (owned by Dell), and the other is more of a punch for Cisco and Juniper in that it’s aimed at service providers. In fact, at the event Intel said Verizon was testing a prototype version of its reference design. With these offerings, Intel is putting Broadcom, a popular maker of merchant silicon, on notice that it’s going directly after its business. That’s not surprising. The only question is how low Intel will go in pricing to put the hurt on Broadcom. But it’s also providing designs and capabilities that could obviate the need for special-purpose silicon that Cisco and Juniper currently rely on in their high-end boxes. Intel has gone after special purpose hardware before when it took on Sun and IBM in the server world with its x86 chips for personal computers. Intel’s moves into the networking world are a symptom of the broader shift in computing. On the consumer side, mobility is changing the devices we use. In the enterprise, considerations of power consumption can now trump performance. In fact, super chips like the ones Intel traditionally sells can cause their own challenges in a virtualized world because using all of that capacity requires data center operators to virtualize the hardware and complicate their lives. On the enterprise side the architecture to support our computing needs is changing as well as the workloads. The business considerations are changing too. This is a trend that’s shifting the ground underfoot all of the large IT vendors. So to see Intel going after its fellow chipmakers is perhaps unsurprising, but to see it going after Cisco’s and Juniper’s markets is like watching a rat resort to cannibalism during a time of starvation. IT companies aren’t starving yet, but they are under stress, as Intel’s lackluster earnings indicate. The very real disruptions caused by a new generation of computing and web infrastructure are going to eat away at the margins and business models supporting today’s giants. Seen in this context, Intel’s moves aren’t surprising, but they are a symptom of the overall disruption in the IT world. The headline on this story is ridiculous and wrong. Intel is NOT selling network boxes that will compete against Cisco and Juniper. It only selling merchant silicon. That’s hardly a nightmare for Cisco and Juniper. With this announcement, Intel just becomes another component supplier, aiming its guns at Broadcom, not the network gear vendors. A virtual world requires virtualization. Hmmm. ROFLMAO… a little dramatic there.